Have you ever bought a seedling from a nursery or hardware store that came with a little plastic-y garden marker stake to help identify it? 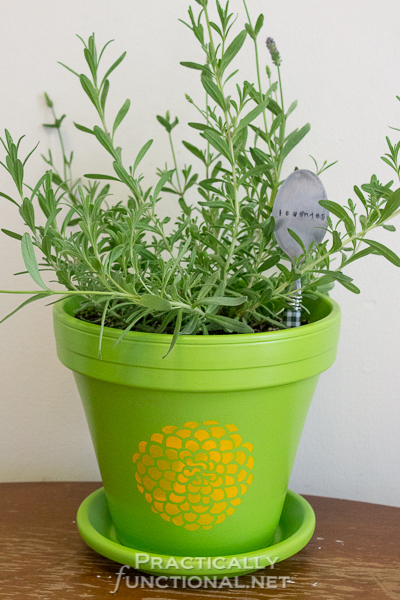 They are totally useful for telling which plant is which (especially when they’re young! ), but they sure are ugly! So I decided to make something a little more fun! My friend Melissa from The Happier Homemaker posted some ADORABLE wine cork garden markers which I love, but I wanted to try out my new metal stamping kit! 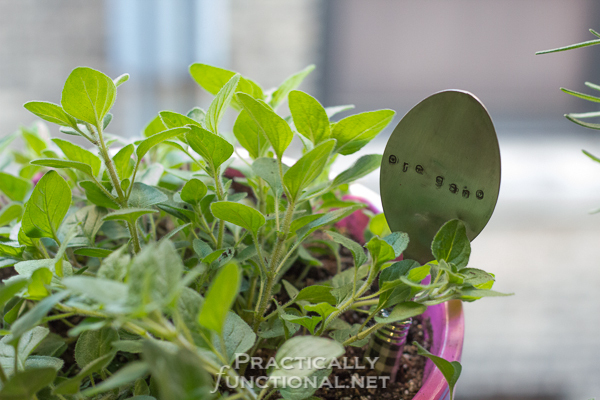 So I made these hammered spoon garden markers instead. Cute and functional, how can you go wrong?! 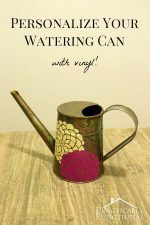 Now, to be fair, metal-stamping is probably not the easiest crafty thing I’ve ever done…but I do have a couple of tips and tricks for you, so don’t get scared off if you’ve never tried it before! Also, the handmade look of misaligned or double-stamped letters is what I love the most about these garden markers! It makes them unique! The metal is pretty strong right at the roundest part of your spoon, but if you smack it with a hammer about halfway between the middle of the spoon and the edge, it flattens out much quicker. Also, the hammer may ding up the metal a bit, so if you want a nice scuff-free surface for stamping, just hammer the back of your spoon. If you’re not worried about scuffs, feel free to hammer on either side; whatever gets it flat! This was the longest, hardest part of the whole project, and it’s the most important too. 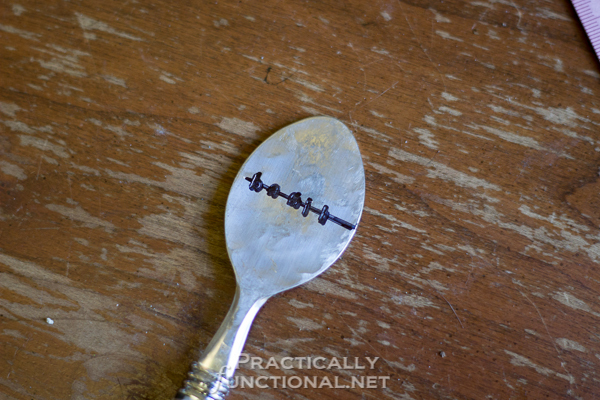 The flatter your spoon is, the easier it will be to stamp your letters into it. If your spoon is still a bit rounded, the stamps will slip a little and you’ll get double-stamped letters. 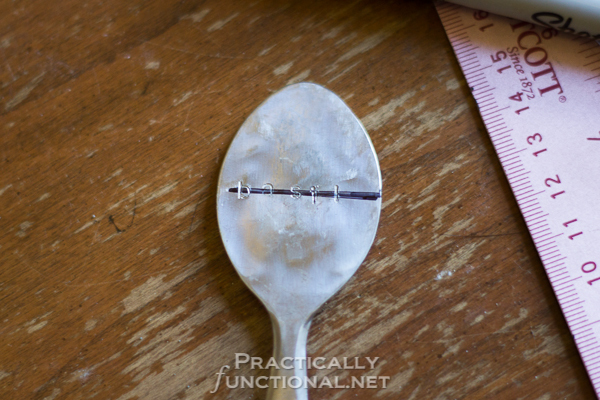 Once your spoon is flat, take your Sharpie and ruler and draw a line across the middle of the spoon to help you line up your letters. You can mostly eyeball this; it definitely does not have to be perfect. 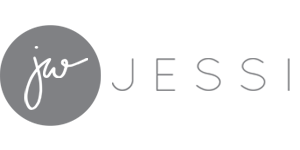 Then grab your metal stamps and start stamping! Start in the middle. 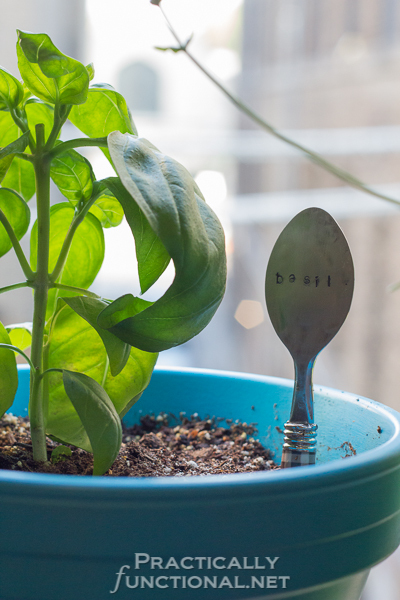 So for the basil spoon above, stamp the “s” first, that way you can be sure it’s centered. Especially helpful for long words like “lavender”! 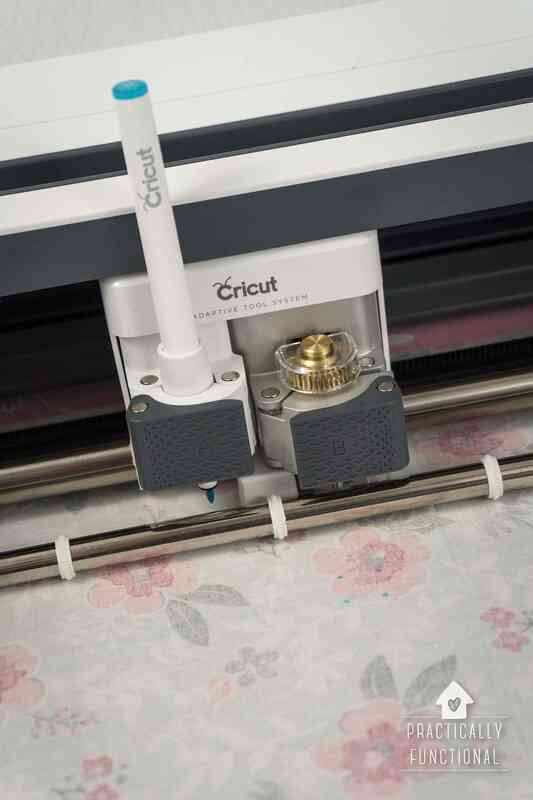 You need to hit the metal stamp pretty hard to get a good impression, but accuracy is way more important than power! Be sure to hold the stamp still when you hit it; it’s easier to hit the stamp ten times kinda lightly than it is to whack it really hard and have it jump out of your hand. Then you’ll have to try to line it up again to get the second hit, and that’s hard to do! Practice practice practice! Spoons are cheap, so grab a few extra and practice! You’ll learn really quickly what works for you and what doesn’t! Don’t sweat it! (See above re: cheap spoons!) The “sage” spoon actually says “sage e” cuz I messed up on the “e” the first time around…and it doesn’t matter at all! Redo it if it bothers you, or leave it and just call it “character”! Once you have your letters stamped, color them in with your black Sharpie. See how it’s a little hard to read the letters in the picture above? This part will help with that. Now take your sandpaper and scrub until all of the Sharpie on the surface of the spoon is gone! There will still be black Sharpie in the stamped letter groove, but you don’t want the Sharpie line to show on your finished spoon. Once you have it sanded and looking the way you want, wipe the spoon off with a slightly damp rag, and you’re done! The letters are darker now and easier to read, plus it gives it sort of an antiqued look! 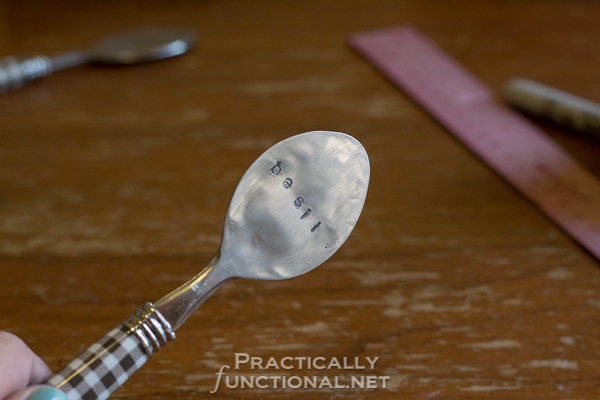 Stick the handle of the spoon into your garden and voila: Metal stamped garden marker spoons! See how the letters are a bit misaligned on the oregano spoon? Character, I tell ya! The spoons look especially cool with big bushy plants that sort of grow up around them like this lavender! And isn’t that pot cute?! You can see how I made it (and sealed it so the paint won’t be ruined when I water it!) in this tutorial. Do you use garden markers in your garden? 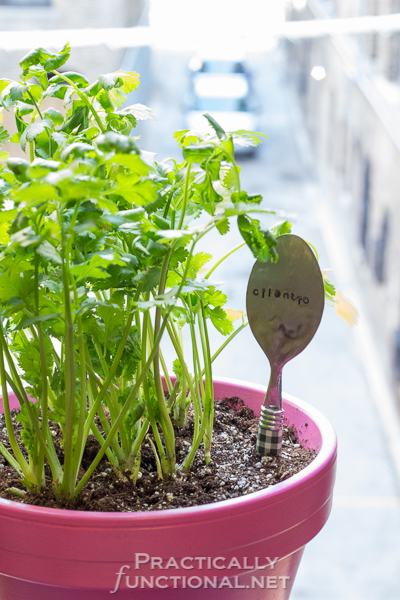 I know once the plants are this size, it’s easy enough to tell them apart if you’re familiar with the herbs you’re growing, but these spoons are so cute even if they’re just for decoration! « Window Cleaning The Easy Way! These are so cute! Now I wished I snagged those stamps from Pick Your Plum, ha ha. I’ll keep an eye out for a set so I can stamp away! Right?! PYP has them every once in a while, and I missed them the first time around, but got them last time! If I see ’em I’ll let you know! Super cute!! It adds a decorative touch to the plant. So fun and cute!! Those are so fantastically cute! I wish I knew someone who liked to garden (besides me) that I could make a set for as a gift! so so cute, jessi! love the look of stamped spoons! They are gorgeous! What a great idea to use the black marker too! 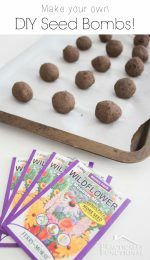 If you have a minute to spare I’d be so thrilled if you could share this post at my weekly Say G’Day linky party! This would be a brilliant addition! Wednesday Whatsits – hope you have a great day! I LOVE these hammered spoons for all sorts of projects! Thanks so much for inspiring me to get out my old mis-matched spoons and craft with them! I really love this idea! 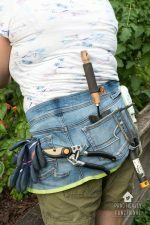 I have none of these tools at home, but would love to borrow them to try this project. Thanks so much for sharing, Jessi! So so cute!! Pinning this. Thanks for linking up at Romance on a dime!! 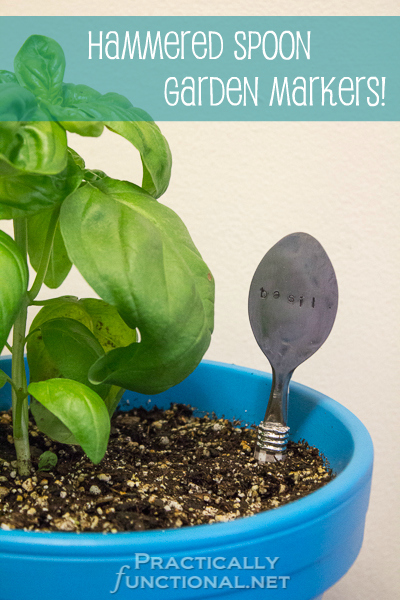 Your spoon garden markers are so cute and I’ve got these linked to my DIY garden plant markers post too today! I love these because they’re more ‘permanent’ than some of the other plant markers a person could make. The fewer times I have to remake or re-do things, the better. 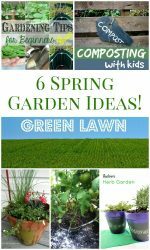 Definitely, you can leave them in the ground all year, or use them again each year in pots if you plant the same things!